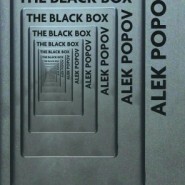 The Black Box is the latest satirical novel from one of Europe’s funniest and most exciting emerging writers. In 1990 two Bulgarian brothers, Ned and Angel, receive an unusual package from the USA: a black plastic box containing the ashes of their late father, a professor allowed out of communist Bulgaria to teach in the USA during the 1980s. However, the brothers are left with a nagging sense that something is not quite right. Since neither of them has seen the body they begin to doubt if he is he really dead. But if the death had been faked, why? Fifteen years later, as the brothers forge new and very different lives in their new home in New York, some answers begin to emerge… A darkly comic tale of disillusionment, The Black Box explores the nature and logic of our Western neo-liberal capitalist system and how so many of us are all driven to acts of greed, imprudence and recklessness in the pursuit of money and wealth. Translated from the Bulgarian by Daniella and Charles Edward Gill de Mayol de Lupe.